This passage is in essence Joshua’s commissioning. After Moses’ death, it is Joshua’s calling to lead the people. He is the successor to Moses and the chosen of YWHW. And now it is Joshua that leads the Israelites across the Jordan and into a new land. 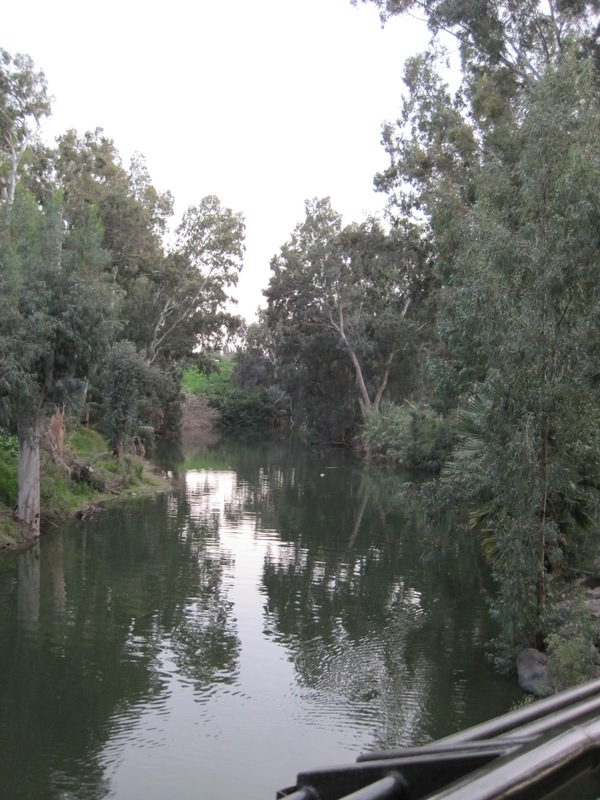 The crossing of the Jordan was indeed significant. After all this time, all this wandering, all these years of uncertainty and trepidation, they were crossing over. It was as if it was all starting to make sense. And yet there had to be some uncertainty there. I mean, it wasn’t a perfect situation. The leader that they had trusted for so many years had been replaced by another—one about whom they were excited and yet he was untested. They didn’t know how things would go. And, “Promised” or not, this was a new land, a new place. Change was all around them. So in this passage, God “exalts” Joshua. In essence, Joshua has a resume’ to present to the people. But coming into the land, there seems to be a problem. There are other peoples living there. Now, the idea of driving out those who were there before them is bothersome for us, to say the least. I guess we could chalk it up to historical and cultural context. Or we can read the sentence again and consider the context in which it is written and see it a little bit differently. The text doesn’t say that God is killing these “others” or blowing them up. The text says that the living God will drive from before you the Canaanites, the Hittites, etc…etc…I don’t know. Maybe it’s a way of saying that the Lord will lead you to live with these people and still remember who and whose you are. Maybe God is promising that, as compared with the times of slavery in Egypt when you were completely swept into a culture and a way of worshipping that wasn’t yours, that this time, in this land, the Promise of “Chosenness” will hold. God will figuratively drive from before you the ways of the Canaanites, the Hittites, etc…etc…In THIS land, you will be who you are called to be. And, as a reminder, God calls Joshua to direct the entrance of the Ark of the Covenant into this land. There are a lot of instructions in this passage. There was a definite intention to get this right. You see, it wasn’t just any old box that was being carried into this place. This was the Ark of the Covenant. It held the holy scrolls and, in essence, the holiness of these people. It was the tangible reminder of who they were. It has been painstakingly carried with them for all those years. Some would surmise that the Ark finally had a home, a stable place where it would always be. Now we don’t get this from this small part of the larger story, but the twelve men that were chosen from the twelve tribes were not just fodder for the parade. In the next chapter, these men piled up twelve large boulders at the very spot where the priests had stood with the Ark of the Covenant as the waters stopped flowing so that the people could cross over on dry land. The stones were part of their identity. It was these twelve tribes coming together and claiming who they were. And the Ark that they had carried for years was a reminder that God’s Presence had always been with them, delivering them, redeeming them, and showing mercy. They are not “locking in” the Ark of the Covenant. (In fact, perhaps the place itself is not as important to God as the reminder to tell the story. If the PLACE was important, then I don’t think it would have been moved and destroyed so many times in the centuries that would come after this.) They are embracing it as God’s Presence among them. They are claiming their identity as part of this universal priesthood of all believers. And so, now, the entire nation crosses over the Jordan. They enter a new life, a life of Promise and hope, a life to which they have journeyed for years. Now it is time to live into this new life. b. What do you think was meant by the notion of “driving out” others? c. How can this passage speak to us and to our time? d. What image of God is present in this passage for you? Remember that in our previous readings of Paul’s letter to the church at Thessalonica, Paul exhorted them to be strong, to hold on to their faith, even in the midst of conflict and persecution. We are told that the Thessalonians accepted what they heard not as a “human word” but as “God’s Word.” And yet, the letter also affirms that the Word is at work in the Thessalonian church as believers. Essentially, this Word of God is not just floating up in the air somewhere, but becomes incarnate in this world, becomes the Living Christ in this world as believers in it live it out in their life and in their work. This Word of God was heard as a witness to God’s work in the world, to God’s work in Jesus Christ. It was a witness that was heard from Paul, Silvanus, and Timothy who also spoke words of encouragement just as they proclaimed the Word of God. On some level, some of this passage could almost be taken as Paul’s touting of himself and his compatriots who witnessed to the people. There are some commentators that think that perhaps Paul was responding to previous criticism (of which we have read before) that he and his companions preached for their own gain—either financial or to achieve a higher status within the society. This is once again a reminder that that was not the case. Paul is working to structure a case for his and his disciples’ integrity. He is saying again that he has done everything he has done and everything he can do to encourage these believers in the faith. And then he is affirming them for accepting the words the way they were intended—not for ill-gotten gains but as a witness to the Word of God that should be lived out in their lives. In a previous reading from the First Letter to the Church at Thessalonica, you’ll remember that Paul talked about a “mothering nurse” as a nurturing care toward the people. Here, he uses the image of a father with his children, laying out a relationship that includes guidance and integrity. They are both relational images. It reminds us that living out this witness is about living in relationship with God and with one another, encouraging each other, loving each other, and guiding each other in the faith. It is also a reminder that as children of God, we are all related, all inter-connected. Take that a step future and it can also be taken as a reminder that everything we do affects others. How many times to do we provide encouragement or guidance when we don’t even realize we are doing it? How many times do we provide compassion and nurturing when we don’t even think about it? (And, I suppose, how many times to we neglect to provide those things because we do not realize how someone is looking to us for direction?) It’s more than just being a “good example”. It’s realizing that everything we do and everything we are is done within this community of which we are a part. Witnessing to and living out the Word of God means living in relationship with one another. b. What does it mean to you to “witness” to the Word of God? c. How can this speak to us today and the way we relate to one another in our own society? d. What does it mean to say that we are the ones called to proclaim and to live the reign of God? e. What does it mean to claim that we do that “with anticipation”? f. I asked this in our discussion of a previous reading of Paul’s writing: What sort of letter would Paul write to our community or our society? Once again, we have a passage with Jesus confronting the “powers that be” of the first-century Jewish society. Keep in mind, though, that Jesus was Jewish. (Contrary to what we sometimes allow ourselves to think, Jesus was never a “Christian”!) So with that said, this sort of becomes a family conflict. But Jesus begins by acknowledging their power and authority. “Sitting on Moses’ seat” implies that he saw them as the ones in the position of teaching and interpreting the Torah and that they were to be followed. But then he quickly tells his hearers not to do what they do. Apparently, what they were teaching and how they were living were not aligned with one another. Jesus claims that they are interpreting Scripture in a way that it was not mean to be interpreted and were, in essence, laying needless and unsupportable “burdens” on those who followed them. They were interpreting Scripture in a way that was never intended. For instance, the interpretation of what should happen in order to observe the Sabbath or ritualistic purity codes might have been impossible for the poor to follow. The Pharisees were interpreting Biblical law in such a way that further marginalized the marginal in the society and in many ways made religious practices abusive rather than transformative. Jesus then takes on the Pharisees desire for honor and status. They want to put themselves in a place of honor and wear elaborate prayer shawls to call attention to themselves and how “holy” they are. What Jesus was saying was that the honor, the prestige, the place of status should all belong to God. We are all disciples, all students of the teachings of God and we are called to humble ourselves before God. Once again, it was a reversal of the norm. These learned rabbis were used to being on the top of society. They were used to having their teachings heard, probably even memorized and put to heart. They were used to being exalted. And now Jesus is saying that it is humility that is the greatest, that one who recognizes his or her place before God and exalts God, will, indeed be a witness to the Word of God. As for burdens, if we truly “take on” the yoke of God’s word, then the law will live itself out within our lives. It will not be looked upon as a burden or something that we need to do to “prove” ourselves worthy of God. And if there are those who are expecting others to somehow do specific things to “prove” their love or their worthiness of God, then they just don’t get it. It’s not about us; it’s about God. God is God; we are not. Jesus was in no way being “disloyal” to the Torah; in fact, he was being true to it. Jesus’ notion of the “Law” was not burdensome; in fact, it was life-giving. It brought freedom rather than constraint; it brought love rather than rules; it brought life rather than death. It, again, is a reversal of the norms of this world. And Jesus probably was NOT “anti-Pharisee” the way some of us would like to believe. They were part of his “family”, remember. And they had probably started out with good intentions, wanting to serve God, wanting to help others understand the Torah. But somewhere along the way, it became about them rather than about God. It probably happens to the best of us! I think this passage provides a good check of our own religion, the way we practice and live out our faith. I guess if I were to put it simply in the context of my own Christian faith tradition, I would say that “religion without spirituality” is practicing the religion about Jesus. It sounds good, but it doesn’t have any depth, no engagement. And “spirituality without religion” has a good possibility of becoming the religion about myself. I think they need to come together—both spiritual religion and religious spirituality. Then one will have the opportunity to practice the religion of Jesus. I think that is the way we get out of ourselves and become one with God in a real and authentic way. You cannot practice religion for religion’s sake. That would certainly be the death of your being. You need to somehow breathe life into it. That’s where spirituality comes in. Together they are religiosity on life support—a practice of faith, an embrace of the faith community, a recognition of one’s call to help and serve others, all with the Spirit of God, the life of your being, breathed into onself. b. What does it mean for you to think of the Law, the Torah, the teachings of the faith as “life-giving” rather than binding rules? c. How can this passage speak to us today and the way religion is looked at in our society? d. How would you respond to the increasingly-popular claim of being “spiritual but not religious.”? Lord God, your love has called us here, as we, by love, for love were made; your living likeness still we bear, though marred, dishonored, disobeyed; we come, with all our heart and mind, your call to hear, your love to find. Lord God, in Christ you call our name, and then receive us as your wown; not through some merit, right, or claim, but by your gracious love alone; we strain to glimpse your mercy seat, and find you kneeling at our feet.